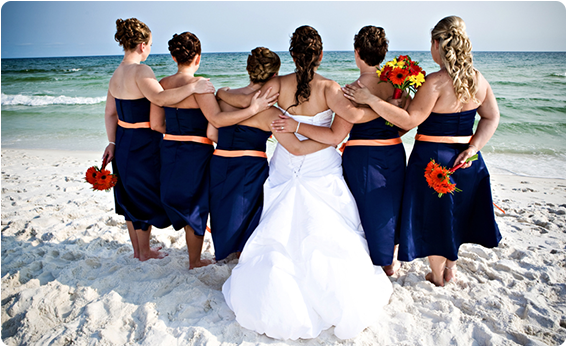 Brava Hair Studio specializes in Beach Wedding up-dos and makeup. We have years of experience creating classic and unique styles. Our experience and weather resistant products will insure that your beautiful look will last all day and evening, even in wind and humidity. Our stylists have international training in the latest up-style techniques. See our education page for some of our latest workshops. We work closely with Barefoot Weddings and Forever I Do Weddings and Events...the areas premier wedding planners! Visit their web sites at www.barefootweddings.net and www.foreveridoweddings.com. Our experience and weather resistant products will insure that your beautiful look will last all day and evening, even in wind and humidity. We also retail a full line of beautiful crystal clips to adorn your style. Please arrive for your appointment with dry/clean hair. Do not add any products to you hair- we have everything we need to keep your hair soft, shiny, in place, and humidity resistant. If necessary, a shampoo and blow dry will be done at the salon for an additional charge of $35. If you come with wet hair a blow dry charge of $10 will apply. We suggest wearing a button down shirt so you will not have to mess up your hair when getting dressed. Up-Dos and Special Occasion Styling for Brides includes veil and tiara placement. We do retail tiaras and flowers if you decide last minute to add to your style. Brides love wearing GloMineral makeup because it delivers a flawless finish with continuous, long-lasting coverage. It is non-comedogenic and waterproof, allowing our brides to dance the night away while her skin feels as if she had nothing on. Our makeup provides broad-spectrum UVA/UVB protection, perfect for the bride with an outside wedding! GloMinerals feels weightless on the skin, giving a natural, airbrushed finish while photographing beautifully. Please arrive with a clean moisturized face. Make sure all eye liner and mascara is removed. We offer a Mini-Makeup Prep Facial for $20 if needed. The perfect treatment prior to a GloMineral Makeup application on your special day! Includes a gentle cleanse, purifying toner, a calming serum and the perfect moisturizer for your skin.